These are incredibly cool-looking, the assets are already there, so why not release them as new Auras? Do you still have your other pictures and suggestions? For the other mentalist auras? That doesn't look like more than one aura to me; all three are just a single flaming spot in the middle of the forehead (the second one also is using a costume part whose name I forget, third eye tattoo or something). No, what you're thinking of isn't what is shown here for two of the pics. They are two very different auras. 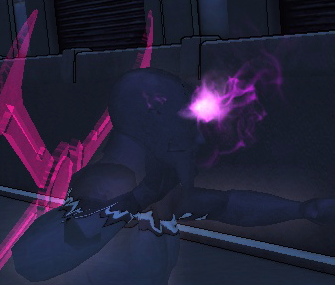 PSI Hypnotist has the Third Eye Aura and something else. Yeah, I’d taken those screens a while back and wasn’t sure, but upon further inspection I believe they’re one and the same. The 2nd pic there just happens to resemble PSI’s trident design a little bit. My bad. The third eye is something else entirely, some face pattern/paint and not part of the Aura (although, we do have a Third Eye Aura – from the “Aura Pack: Eyes Assortment”, in the Z-Store). And finally, we have AOAC's legacy aura, which is a similar forehead emanation/glow with mystical runes.